Blues guitarist Otis Taylor and the Santa Cruz Guitar Company have a long history of working together. Several years ago, Santa Cruz introduced its first Otis Taylor signature model, a guitar based on its H model (which in turn takes inspiration from vintage Gibson Nick Lucas guitars), and now the company is offering a second model, the Otis Taylor Chicago. While the original Otis Taylor model is built with rosewood back and sides and a spruce top, the Chicago has an all-mahogany body, similar to the construction of Santa Cruz’ 1929 series guitars. Like the first Otis Taylor, the Chicago has a 13th-fret neck joint and is only fretted up to the 14th fret. The fingerboard extension over the body has just the one fret, but sports an inlay with Otis Taylor’s logo. The Santa Cruz Otis Taylor Chicago is a great sounding guitar with a bluesy growl, but also a versatile voice that would work well in a variety of styles. 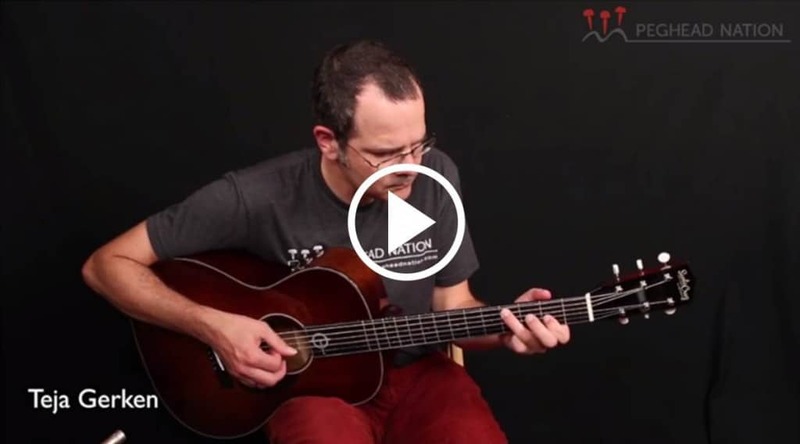 It is demonstrated here played fingerstyle in standard and D A D G A D tunings by Peghead Nation Co-Founder and Producer Teja Gerken and played with a flatpick by Peghead Nation Co-Founder and Editor Scott Nygaard. SPECS: H body with 13-fret neck. Solid mahogany top, back, sides. Mahogany neck. Ebony fingerboard and bridge. 25.325-inch scale. 1¾-inch nut width. Vintage-style open-back Gotoh tuning machines. Made in USA. santacruzguitar.com.